Hiring? Toptal handpicks top Android engineers to suit your needs. If you don’t choose the right architecture for your Android project, you will have a hard time maintaining it as your codebase grows and your team expands. This isn’t just an Android MVVM tutorial. In this article, we are going to combine MVVM (Model-View-ViewModel or sometimes stylized “the ViewModel pattern”) with Clean Architecture. We are going to see how this architecture can be used to write decoupled, testable, and maintainable code. Why MVVM with Clean Architecture? MVVM separates your view (i.e. Activitys and Fragments) from your business logic. MVVM is enough for small projects, but when your codebase becomes huge, your ViewModels start bloating. Separating responsibilities becomes hard. MVVM with Clean Architecture is pretty good in such cases. It goes one step further in separating the responsibilities of your code base. It clearly abstracts the logic of the actions that can be performed in your app. Note: You can combine Clean Architecture with the model-view-presenter (MVP) architecture as well. But since Android Architecture Components already provides a built-in ViewModel class, we are going with MVVM over MVP—no MVVM framework required! Your code is even more easily testable than with plain MVVM. The package structure is even easier to navigate. The project is even easier to maintain. Your team can add new features even more quickly. It has a slightly steep learning curve. How all the layers work together may take some time to understand, especially if you are coming from patterns like simple MVVM or MVP. It adds a lot of extra classes, so it’s not ideal for low-complexity projects. Our business logic is completely decoupled from our UI. It makes our code very easy to maintain and test. The example we are going to see is quite simple. It allows users to create new posts and see a list of posts created by them. I’m not using any third-party library (like Dagger, RxJava, etc.) in this example for the sake of simplicity. Even within the Android app architecture we’re using, there are many ways to structure your file/folder hierarchy. I like to group project files based on features. I find it neat and concise. You are free to choose whatever project structure suits you. This includes our Activitys, Fragments, and ViewModels. An Activity should be as dumb as possible. Never put your business logic in Activitys. An Activity will talk to a ViewModel and a ViewModel will talk to the domain layer to perform actions. A ViewModel never talks to the data layer directly. Here we are passing a UseCaseHandler and two UseCases to our ViewModel. We’ll get into that in more detail soon, but in this architecture, a UseCase is an action that defines how a ViewModel interacts with the data layer. The domain layer contains all the use cases of your application. In this example, we have UseCase, an abstract class. All our UseCases will extend this class. * Data passed to a request. * Data received from a request. And UseCaseHandler handles execution of a UseCase. We should never block the UI when we fetch data from the database or our remote server. This is the place where we decide to execute our UseCase on a background thread and receive the response on the main thread. As its name implies, the GetPosts UseCase is responsible for getting all posts of a user. The purpose of the UseCases is to be a mediator between your ViewModels and Repositorys. Let’s say in the future you decide to add an “edit post” feature. 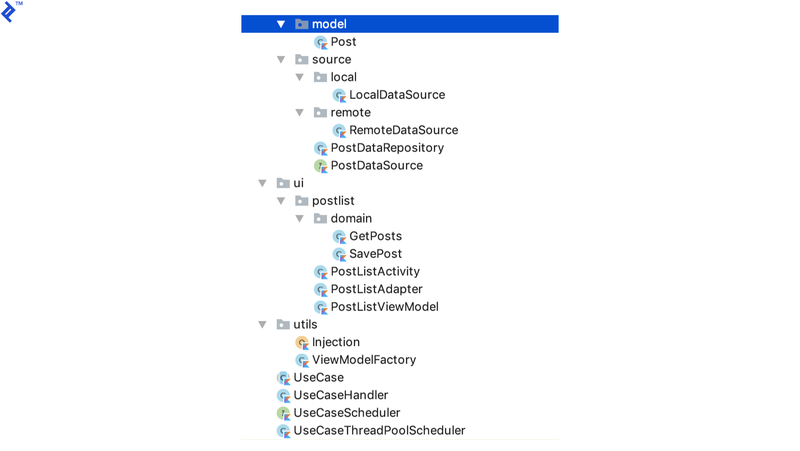 All you have to do is add a new EditPost UseCase and all its code will be completely separate and decoupled from other UseCases. We’ve all seen it many times: New features are introduced and they inadvertently break something in preexisting code. Creating a separate UseCase helps immensely in avoiding that. Of course, you can’t eliminate that possibility 100 percent, but you sure can minimize it. This is what separates Clean Architecture from other patterns: The code is so decoupled that you can treat every layer as a black box. PostDataRepository implements PostDataSource. It decides whether we fetch data from a local database or a remote server. The code is mostly self-explanatory. This class has two variables, localDataSource and remoteDataSource. Their type is PostDataSource, so we don’t care how they are actually implemented under the hood. In my personal experience, this architecture has proved to be invaluable. In one of my apps, I started with Firebase on the back end which is great for quickly building your app. I knew eventually I’d have to shift to my own server. When I did, all I had to do was change the implementation in RemoteDataSource. I didn’t have to touch any other class even after such a huge change. That is the advantage of decoupled code. Changing any given class shouldn’t affect other parts of your code. UseCaseThreadPoolScheduler is responsible for executing tasks asynchronously using ThreadPoolExecuter. This is our ViewModelFactory. You have to create this to pass arguments in your ViewModel constructor. I’ll explain dependency injection with an example. If you look at our PostDataRepository class, it has two dependencies, LocalDataSource and RemoteDataSource. We use the Injection class to provide these dependencies to the PostDataRepository class. Injecting dependency has two main advantages. One is that you get to control the instantiation of objects from a central place instead of spreading it across the whole codebase. Another is that this will help us write unit tests for PostDataRepository because now we can just pass mocked versions of LocalDataSource and RemoteDataSource to the PostDataRepository constructor instead of actual values. Note: I prefer using Dagger 2 for dependency injection in complex projects. But with its extremely steep learning curve, it’s beyond the scope of this article. So if you’re interested in going deeper, I highly recommend Hari Vignesh Jayapalan’s introduction to Dagger 2. Use LiveData or RxJava to remove callbacks and make it a little neater. Use Dagger 2 to inject dependencies. This is one of the best and most scalable architectures for Android apps. I hope you enjoyed this article, and I look forward to hearing how you’ve used this approach in your own apps! Android architecture is the way you structure your Android project code so that your code is scalable and easy to maintain. Developers spend more time maintaining a project than initially building it, so it makes sense to follow a proper architectural pattern. In Android, MVC refers to the default pattern where an Activity acts as a controller and XML files are views. MVVM treats both Activity classes and XML files as views, and ViewModel classes are where you write your business logic. It completely separates an app's UI from its logic. What is the difference between MVP and MVVM? In MVP, the presenter knows about the view and view knows about the presenter. They interact with each other through an interface. In MVVM, only the view knows about the view-model. The view-model has no idea about the view. What are the key components of Android architecture? One is separation of concerns, i.e. your business logic, UI, and data models should live at different places. Another is the decoupling of code: Every piece of code should act as a black box so that changing anything in a class should not have any effect on another part of your codebase. Robert C. Martin's "Clean Architecture" is a pattern that lets you break down your interaction with data into simpler entities called "use cases." It is great for writing decoupled code. Most apps save and retrieve data, either from local storage or a remote server. Android repositories are classes that decide whether data should come from a server or local storage, decoupling your storage logic from outside classes. Thank you for great explanation. But i still have some problem to implement this in multi accounts apps. Not sure where we should put account/authorization related information when accessing remote repository. Let's extend your example above where i could get posts from different news provider. In this case we will have several accounts with several access tokens for each news provider. Say that when the first app run we only fetch posts from current active account. And from the same screen user can do switch account to different account then fetch posts from another news provider. Also there could be some operation which run in parallel for all accounts, for example we need to do polling to each news provider to get certain information. Activity -> ViewModel -> UseCase -> Repository -> Remote News Provider Where do you put the access token or utilize account data in above situation? Thank you. There is no one solution for all. Everything depends on your use case. For the case you mentioned, I would implement a <code>GetPosts</code> Usecase which takes userId as the <code>RequestValue</code>. This Usecase request the <code>Repository</code> class for posts, now it is upto repository how it want to fetch that data. First query your local storage for access-token based on userId, then make a remote call to <code>RemoteNewProvider</code> <blockquote>Where do you put the access token or utilize account data in above situation?</blockquote> Your access token should be in your local storage as you will need it in every api call (or you can cache it in memory depending on your case). Your <code>UseCase</code> classes should never know anything about user's account data. You should send some identifier (ex - userId) from your viewmodel which would be used to know which account is asking for posts. Did it clarify your problem? I see, so in this case only Repository layer knows how to fetch the token for each account from account manager instance through it's interface. For example wrapping android AccountManager then pass it as constructor parameter for Repository. It's hard to say without understanding how you are using Account Manager but that is one of the way. No problem. I understand better now. Can you share a repository on github, for example, with this example? The UseCaseHandler part is weird design, why would you execute your use case on background design. It is should be responsibility of the repository to fetch data in the background, user case shouldn't be aware of these details. Anything that happens in <code>Repository</code> class should be on background thread. I can't think of a single use case where <code>Repository</code> class needs to do anything on main thread. It should never know anything about threads. It should execute call on whatever thread it is called on. Another reason I can think is switching thread in <code>Repository</code> class will make it a nightmare to write tests for it. If user wants to perform data fetch from server and let the app user to keep waiting.. Then how will activity knows that its fetching data from from server and show please wait message. All the requests begin from activity. When you call Viewmodel's method to execute a particular UseCase, that's when you show the loading message and remove it when you get response from the Viewmodel. Abhishek has been doing Android development since 2014, is an entrepreneur, and understands the importance of proactivity and results. He has contributed to apps with more than 5 million downloads and worked with startups where he was the sole developer as well as with big companies leading a team of developers. Abhishek is an extremely detail oriented person and goes the extra mile to make beautiful apps.